What do you do when you visit the Badass Crater of Badassitude? You try to become the number one badass. Duh. 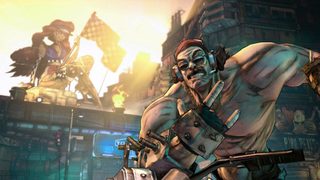 The Badass Crater and your number one title await you in a new DLC campaign for Borderlands 2. The world of Pandora is no stranger to zany characters, so it shouldn't be surprising that Mr. Torgue's Campaign of Carnage, the second DLC add-on for Borderlands 2, delivers on that front. The DLC sheds some light on weapons manufacturer figurehead Mr. Torgue. Torgue is, as you might expect, batshit insane. But it's a certain type of unhinged—think Randy Savage, who Mr. Torgue kind of looks and sounds like. That's appropriate, because the DLC reminds me a ton of wrestling theatrics. You know how wrestlers are always trying to win the belt, or become number one? That's the deal here. There are a handful of bosses you have to defeat to become the number one badass. But it's not as simple as killing them, because Mr. Torgue meddles too much—he wants to make sure everything that happens makes for "good TV," so to speak. The (figurative) audience watching you has to feel titillated! Your ascent to badassitude has to be exciting! So don't be surprised if Mr. Torgue pulls antics like suddenly informing you you're about to get betrayed. Gotta put on a show. I played through one of the main stages, which puts you in an arena where you fight against waves of baddies. Unlike the Mad Moxxi DLC arena, this new area will have enemies fighting each other too. It's every man, freak and midget for himself. That's a good thing, because Torgue's Campaign of Carnage is difficult. So when you're hiding somewhere, hoping to regen your health, you're praying that your enemies become too preoccupied with each other to bother hunting you down. I was surprised to see a number of familiar faces as I played as well. There's Patricia Tannis right at the start, in a brief appearance. One of your sponsors turns out to be Mad Moxxi. There's also the return of fan-favorite Tiny Tina (who is also a possible sponsor.) You'll have to choose between Tina and Moxxi—a tough choice. Worry not though; there'll be a number of new characters to meet too. Fascinating to me, though, is just how much of Borderlands revolves around the guns. Fascinating to me, though, is just how much of Borderlands revolves around the guns. You're always obsessing over them, always sifting through loot, hoping to find something better than what's currently in your hands. Gearbox has gone on record saying that they've designed the manufacturers with the intention of creating brand loyalty to your guns. Some would argue that you basically ARE your gun. Many of the characters you've met in the past—in the first game, in the DLC, or in Borderlands 2—are involved with weapons distribution or manufacturing. This DLC follows suit: you're entering the world of Torgue, a weapons manufacturer, after all. You'll also collect special loot drops specific to the DLC, which you buy with special Torgue currency. You use that currency in Torgue-only vending machines. Aside from guns, you'll also be able to collect new heads and skins for your vault hunter. The awesome thing about the DLCs in Borderlands is that they affect the larger story. You defeat general Knoxx in the original Borderlands DLC, so in Borderlands 2, Atlas is out of business, for instance. But outside the lore, the DLC can be thought of as experiments for Gearbox—testing the waters to see what works and what doesn't. In Knoxx they dabbled with raid bosses and 4 player cars, in Moxxi they played with a bank system—amongst other things. One can't help but wonder what Gearbox is testing with the Torgue DLC, or how this DLC will affect the lore, but it's good to know they're looking to improve and evolve the experience. Mr. Torgue's Campaign of Carnage drops on November 20th, and you can expect it to last from six to eight hours. Those with the season pass will get the DLC for free. The rest of us can expect to drop less than a tenner.